In 2000, the Department of Entomology & Plant Pathology at Mississippi State University (MSU) initiated formal education for those who rear insects under laboratory conditions. 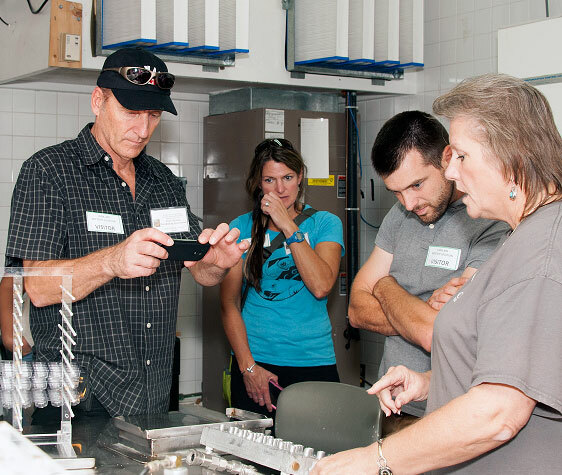 The idea of a workshop devoted to insect rearing was conceived by USDA/ARS and MSU researchers who had spent many years rearing insects professionally. Not only did they recognize a need for insect rearing education in this country; but, based on their extensive international travels, they also recognized a global need for such education. Thus, an intensive five-day workshop titled "Principles and Procedures for Rearing High Quality Insects" designed to cover all the major areas of laboratory rearing of insects and advertised on a world-wide basis was born. The first insect rearing workshop was held fall 2000. Attendance was limited to 24 students primarily to allow hands-on laboratories as part of the educational experience. Because the demand for the workshop was so great, we scheduled a second workshop that same fall. We currently limit attendance to 26 students. We completed our 21st workshop in October 2018. A total of 512 students have attended the workshop. Of these, 147 have traveled to the U.S. from a total of 31 countries. The remaining students originated from a total of 39 states and territories within the U.S. Breakdown of the attendees based on gender and on public institutions vs. private industry are as follows: 53/47% (female/male) and 40/60% (public/private). Dr. Peter P. Sikorowski for his outstanding research on disease and diet contamination and their management in insectaries. Dr. Norman C. Leppla for his superior leadership role in the insect rearing community and for his pioneering and continuing efforts in establishing the "Quality Control Concept" for rearing programs. Dr. Alan C. Bartlett for his scientific contributions to the understanding of genetic changes within colonies of laboratory reared insects. Dr. Pritam Singh for his pioneering efforts in developing artificial diets and systems for rearing many insects in the laboratory. Dr. Frank M. Davis for his development and dissemination of outstanding rearing technology for lepidoptera and for his primary role in the initiation of this workshop. Dr. Allen Carson Cohen for his outstanding contributions to insect nutrition and development of artificial diets for both phytophagous and entomophagous insects. Dr. William "Bill" Fisher for his many outstanding contributions to insectary design and management during his ca. 30-year long career with private industry. Dr. Clarence Collison for his support of the MSU Insect Rearing Workshop from its inception through 2009 as Head of the Department of Entomology and Plant Pathology. Mr. Carlos White for creation of the family-owned company "Insect Lore", which has reared the Painted Lady butterflies used to introduce millions of children around the world to the wonder of metamorphosis. Dr. Muhammad Chaudhury for his many contributions to insect rearing including development work on diets to rear the screwworm fly for the Sterile Insect Technology programs in Central America and for his tireless contributions to this workshop. Dr. Louella Castrillo for her outstanding contributions as the instructor in insect pathology for the International Insect Rearing Workshop. Ms. Carole McReynolds Davis for her service as Frank Davis' helpmate and cheerleader and as an independent and indefatigable dispenser of Mississippi-style, old fashioned Southern Hospitality to all the workshop students, but especially the international students, 2000-2013. Ms. Amanda Lawrence for her indefatigable assistance with the Insect Pathology Laboratory and arranging for and setting up the food at Workshop breaks. 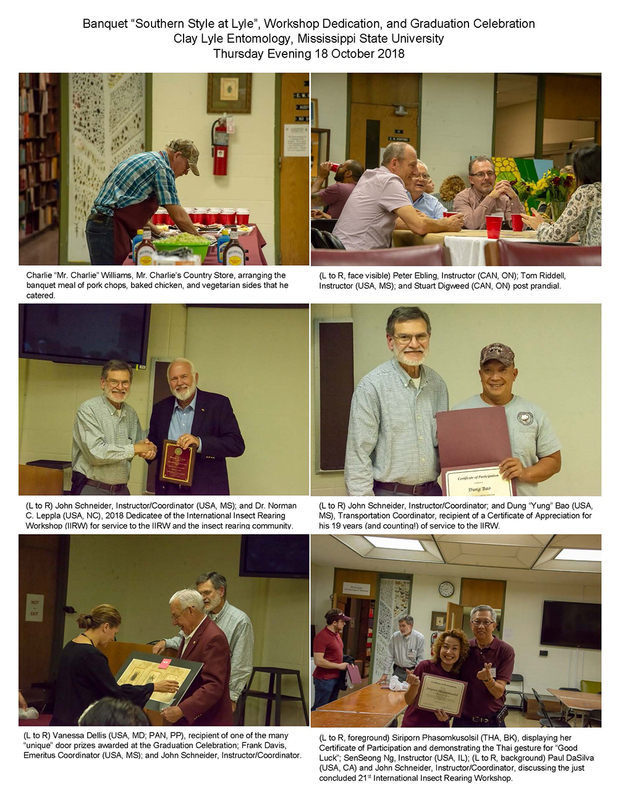 Dr. John C. Schneider for his service to all 19 workshops (2000-to date), editing the book "Principles and Procedures for Rearing High Quality Insect", editing the MSU Insect Rearing website, and maintenance of the MSU Insect Rearing Center. Dr. Norman C. Leppla for his contributions to insect rearing as a discipline and for his service to the insect rearing community both nationally and internationally, including service as an International Insect Rearing Workshop instructor on 18 occasions. 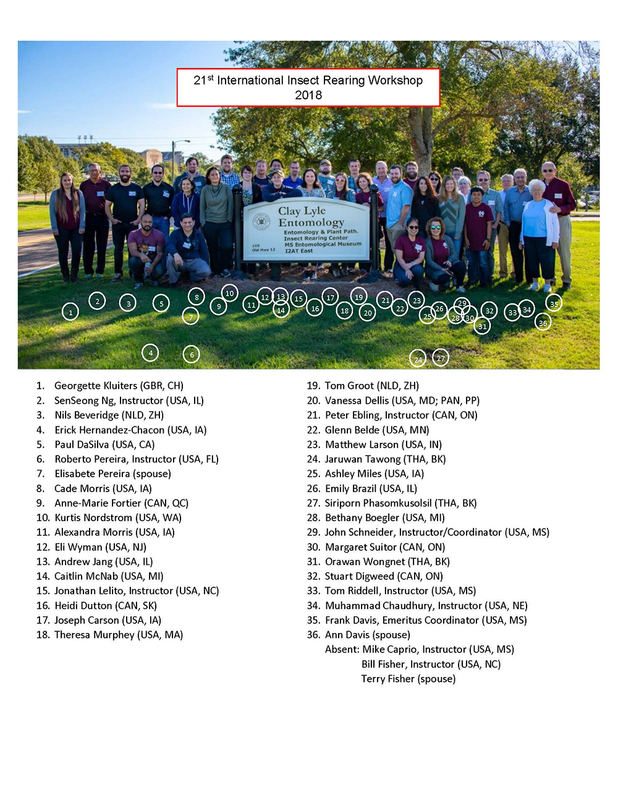 The 500th attendee of the International Insect Rearing Workshop since its inception in the year 2000 was to be the 14th registrant of the 2018 Workshop. As it happened, when Bethany Boegler and Caitlin McNab, both at the USDA APHIS PPQ lab in Brighton, MI, registered together on 8 March 2018, they tied for being the 500th IIRW registrant. Both Bethany and Caitlin were recognized for their joint distinction and were presented copies of The Insect Cookbook: Food for a Sustainable Planet (Arts and Traditions of the Table: Perspectives on Culinary History) by Arnold van Huis and Henk van Gurp at the Celebration Banquet/Dedication/Graduation/Farewell event Thursday evening 18 October. Comment 2: "Thank you all so much. All of the instructors have been wonderful and your time is greatly appreciated!" The next MSU Insect Rearing Workshop will be held Sunday early afternoon through Thursday evening September 29-October 3, 2019. This team of experts includes several who have more than 40 years experience in rearing a wide range of insect species. While presentations contain pertinent basic scientific information, instructors are encouraged to stress the applied side of rearing because problem solving is essential to successful rearing. To enhance the oral presentations, each student will receive our book "Principles and Procedures for Rearing High Quality Insects", a flash drive containing PDFs of the lectures, and a variety of additional information. A student forum/round table will allow attendees to discuss their rearing programs and receive feedback from other attendees as well as from the instructors. A special presentation by an invited lecturer will be announced at a later date. Two laboratories will be held. These newly updated and revamped "hands-on" laboratories will deal with insectary pathology. The first lab is microbiology-oriented and covers identification of various disease agents. The second lab deals with methodologies used to solve disease and contamination problems. Tours will be made of the MSU Insect Rearing Center and the local USDA/ARS rearing laboratory to observe production systems, including facilities, equipment, supplies, and standard operating procedures for various insect species. 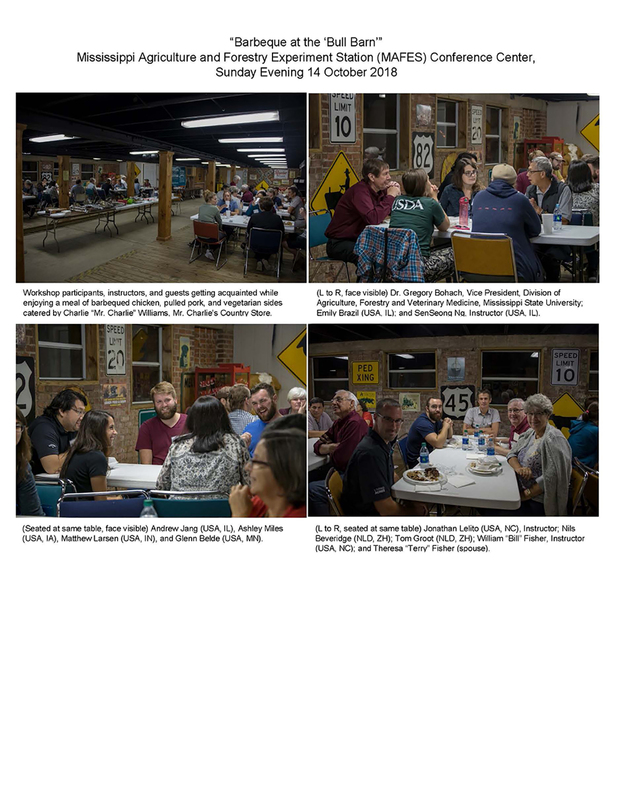 Social events will be held during three evenings and one midday to provide opportunities for lecturers and students to enjoy some delicious Southern cooking while sharing rearing information and just relaxing. Each day, two breaks are held for snacks and additional interchange of information among participants. Networking of students and lecturers is a goal of the workshop because such relationships facilitate the long-term exchange of information and ideas. Dedication of the 2019 workshop may be made at the final social event of the workshop.